p(blue).Guest author Alanna Kellogg is the "veggie evangelist" at A Veggie Venture, a food blog about vegetables. For an entire year, Alanna cooked a vegetable in a new way each day, amassing recipes and techniques for cooking vegetables from A to Z. On day one, she roasted cauliflower; today, she has more than 50 recipes for roasted vegetables. Alanna is also the second-generation author of Kitchen Parade, the food column. Welcome, Alanna! Quick! Name the single technique for cooking vegetables that we can use again and again, the same one for every single vegetable. Hint: It’s perfect for fall, as the air turns cool and our bodies begin to crave hearty food to sustain us through the long dark winter. Give up? You’ll never forget again, once you’ve tried roasting vegetables — whether root vegetables like beets, carrots, sweet potatoes, and parsnips, or others like zucchini, kohlrabi, and winter squashes like butternut and acorn. Truth is, roasting transforms vegetables. 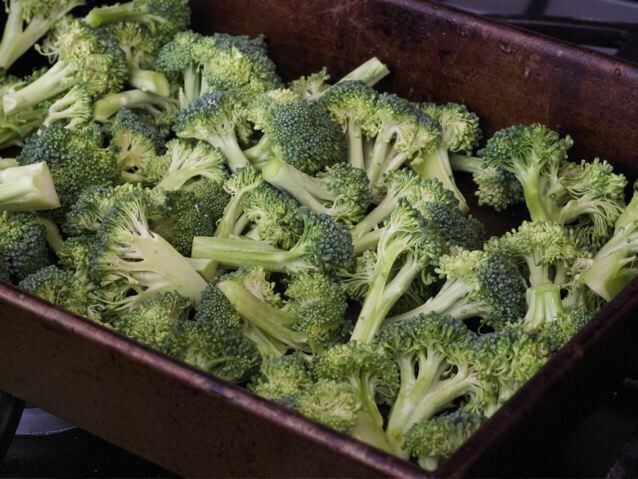 If vegetables were to write a love letter, the page would begin, “Dear Oven: How we love thee. You coax the sweetness from our earthly forms, you transform our color into golden bites of caramel.” The technique is dead simple, requiring just vegetables, oil, seasoning, and heat. Still, a few simple tricks will help. Singles or pairs? Mostly, we roast one vegetable at a time, since it’s hard for more than one kind to finish cooking at the same time. Heat the oven: Roasting temperatures vary. While 200 degrees is perfect for slow-roasting tomatoes, high temperatures like 400, 425, and even 500 degrees are more typical. Same size: While the oven preheats, prep the vegetables. Wash and trim them first, cutting off stems and tails, removing any blemishes, and removing skins. Then cut them into pieces roughly the same size. The smaller the pieces, the quicker the vegetables will roast; the larger, the longer. Coat evenly: Toss the cut vegetables with olive oil in a bowl, really getting in there with a spatula or even your hands, making sure the pieces are coated on all sides. Save the über-expensive, extra-virgin oils for salad dressings and drizzles. For roasting, any good-quality oil will do. I allow a tablespoon of oil per pound of vegetables; it’s plenty, but sometimes I splurge on a couple of tablespoons. Using more oil will shorten the cooking time. Seasoning: A vegetable’s own natural and unadorned flavor will emerge when seasoned with just salt and pepper. For gentleness, use kosher salt or sea salt; for sharpness, use freshly ground pepper. But experiment with other seasonings, too. Carrot is deepened with thyme, zucchini is brightened by lemon. Dried herbs are fine, preferable even. No crowding: Arrange the vegetables on a baking sheet, preferably one with a rim, leaving space between the pieces so the oven’s heat can weave its way between. Check and toss: About halfway through the roasting time, give the vegetables a quick toss, redistributing the pieces. After that, check and toss every five minutes or so, until they’re done. Golden done: The vegetables are done when their centers are soft and creamy and their outside edges almost crisp and beginning to caramelize. Allow 30 to 90 minutes, depending on the vegetable and the oven temperature. Get comfortable with roasting vegetables this fall. Start with a vegetable you already like and find a recipe to eliminate the guesswork for temperature and timing. Soon enough, you’ll be writing your own love letter. p(blue). Editor's note: It's never too late to [/mix/challenge/thevegetablechallenge#joinnow "join the Vegetable Challenge."] Not only is it good for you, it is always in season!